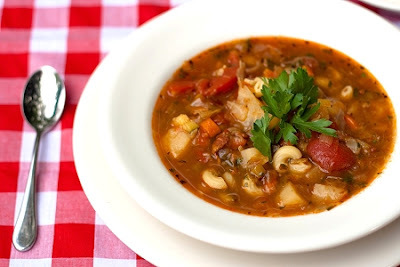 Minestrone is a great way to use left-over vegetables. "Whatever's about to spoil in the fridge"
Heat oil in a large pot. Add bacon or pancetta and cook over Medium heat, stirring, until browned but not crisp, about five to eight (5 to 8) minutes. Add chopped onions and cook about five (5) minutes, however, do not brown. Add carrots, celery and leek and cook until all vegetables are soft, about five (5) minutes more. Crush or chop the tomatoes. Add tomatoes and the juice, broth and water to the pot; stir well. Bring to a boil, then lower heat to a simmer. Snap off ends of green beans; break into approximately 2-inch pieces and add to pot. Add remaining ingredients. Season to taste with salt and pepper, keeping in mind the soup will get saltier as it cooks. Bring to a boil again and cover. Reduce to a simmer and cook for one (1) hour, stirring occasionally but thoroughly, to avoid scorching.. Taste after one (1) hour and adjust seasoning. Continue cooking for one (1) hour more, adding more water if soup gets too thick. Stir thoroughly to avoid scorching. Stir in the cooked pasta and warm through. Serve warm with optional cheese and warm crusty bread. 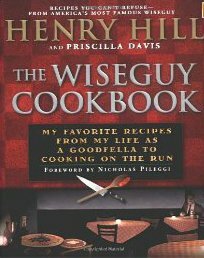 Adapts Henry Hill and Priscilla Davis, The Wise Guy Cookbook: My Favorite Recipes From My Life as a Goodfella to Cooking on the Run (New York: New American Library, a division of Penguin Putnam, Inc, 2002), 107 - 109.